Last year Jon and I were able to take our first ever trip to Disneyland at the end of September, beginning of October. While there, we got to see the park all decorated for Halloween and it gave me some inspiration for decorating at home. 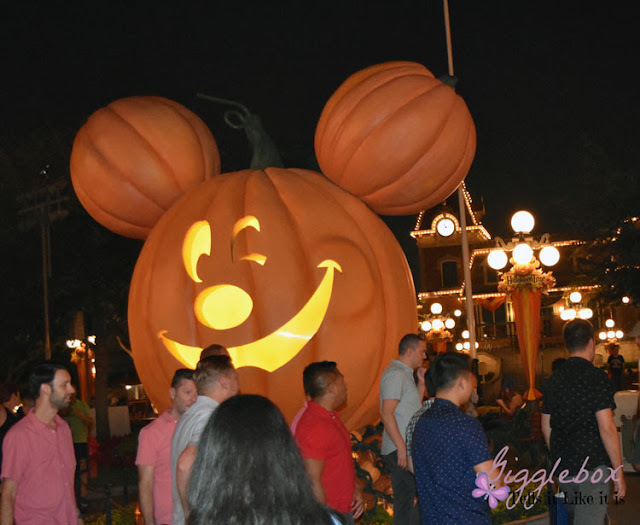 When we walked into Disneyland, we were greeted by this giant Mickey pumpkin. It got me thinking about how I could create this very same pumpkin with real pumpkins at home. 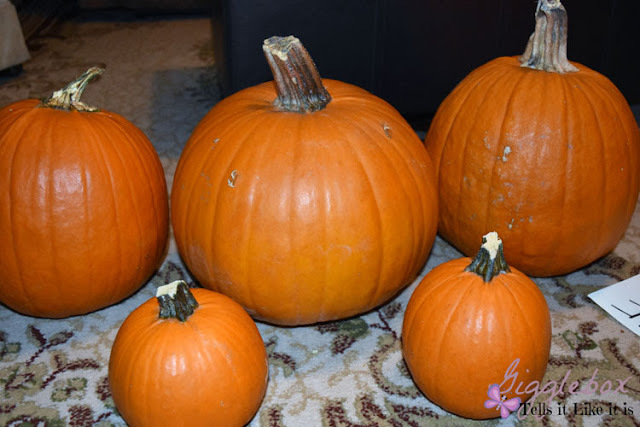 When it came to getting our pumpkins last year, I got a nice round shaped pumpkin and two smaller sized pumpkins for the ears. 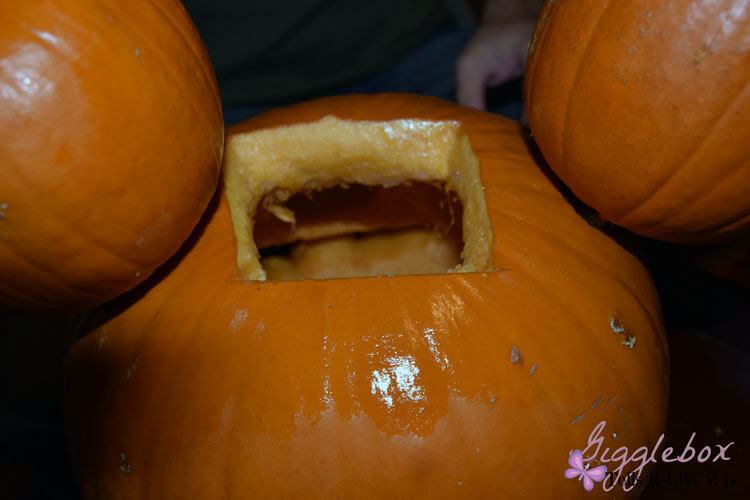 After making this, I think the pumpkins for the ears could have been a little smaller. 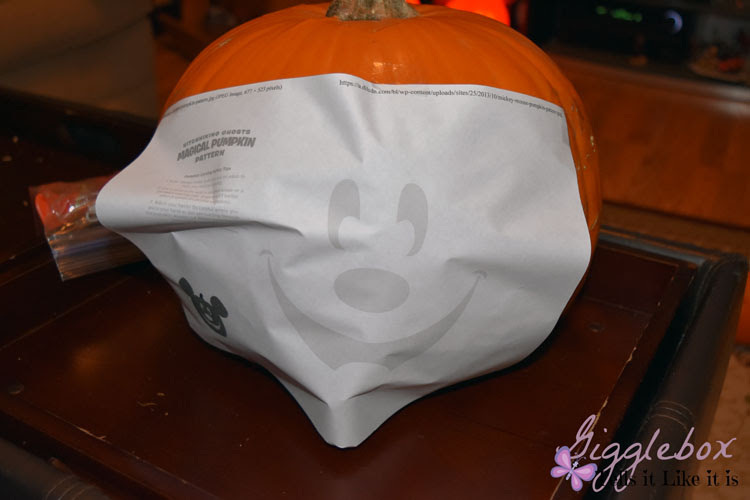 I had printed out this pattern from Oh My Disney (the pattern will be at the bottom of the page). After putting this on the pumpkin, I realized that the pattern was a little too small for my pumpkin. 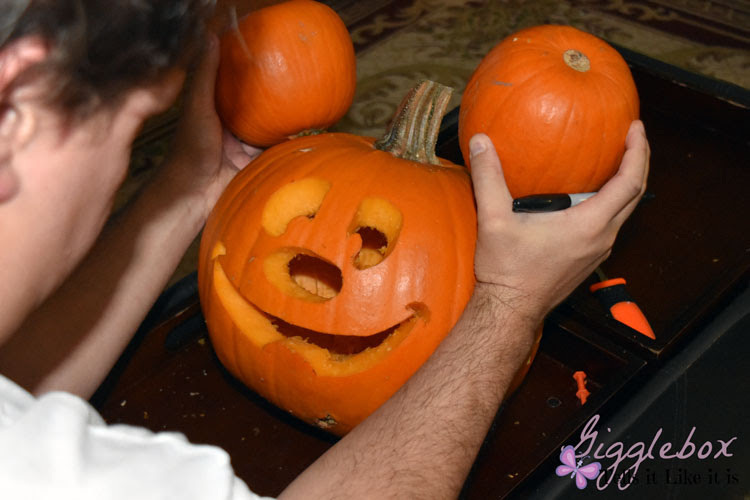 Jon ended up drawing out the face on the pumpkin to make it more scaled to the pumpkin. 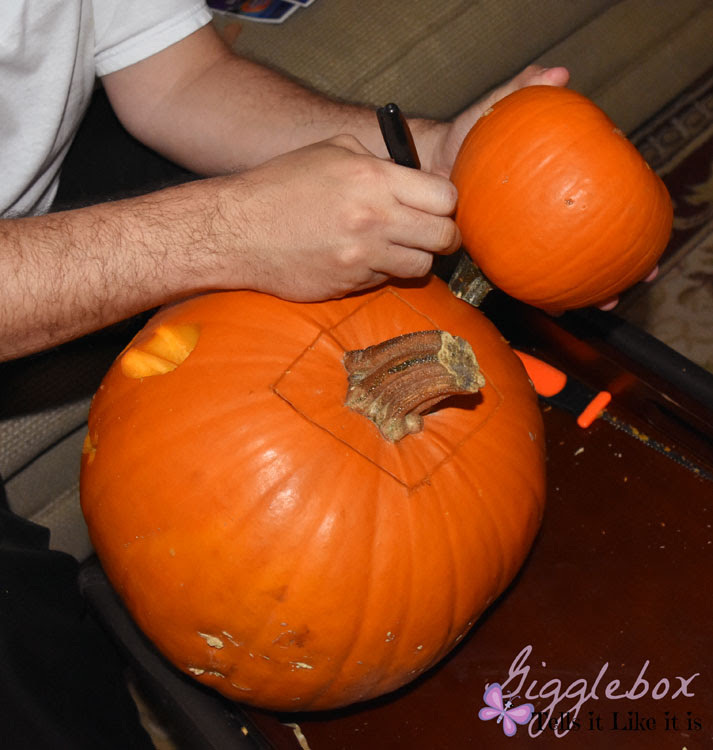 After cutting out the face, Jon took the small pumpkins and figured out the best place for them to be placed. He then traced out the stems on the large pumpkin. We then cut out the circle. After cutting the hole out, we test fit the ear. 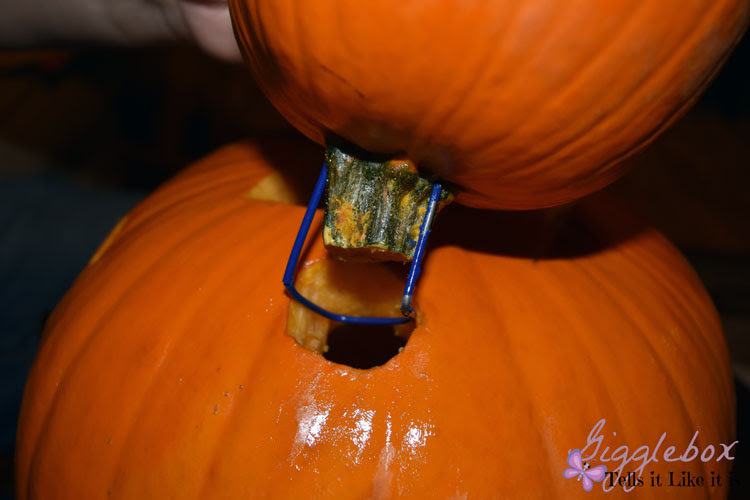 You'll be putting the stem into the hole. After getting the one ear on, we then looked to see where the best place for the other ear. Once we figured out the best place, we did the same steps as the other ear. After getting the ears all fitted, Jon felt that the ears would not stay and needed to have some support. We took a wire hanger and cut it to size. 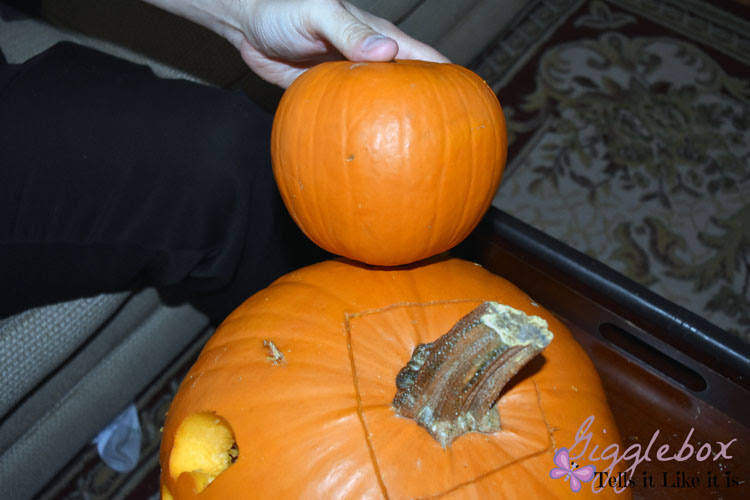 Jon then bent it so that it be harder for the smaller pumpkin to fall out. 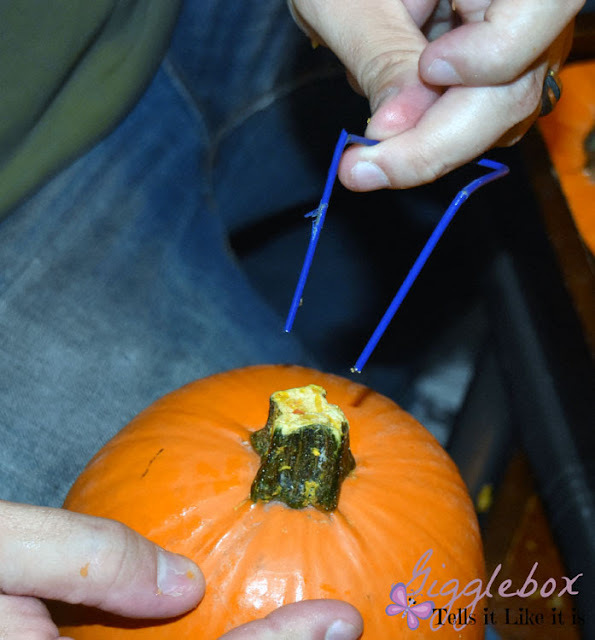 You'll put the wire into the smaller pumpkin and then insert the smaller pumpkin into the hole at an angle. Ear attached. Our wire support worked until someone accidentally kicked it during trick-or-treat. 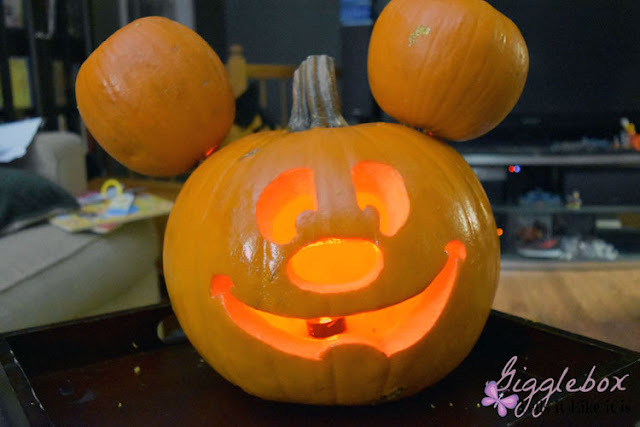 We got so many comments about our Mickey Mouse pumpkin. Just want to let you know that the pumpkin is shiny because I tried the Vaseline trick. Do not do that - it caused Mickey to mold and look horrible a lot quicker than if I had left it alone. I'm thinking about making this again for Halloween this year. 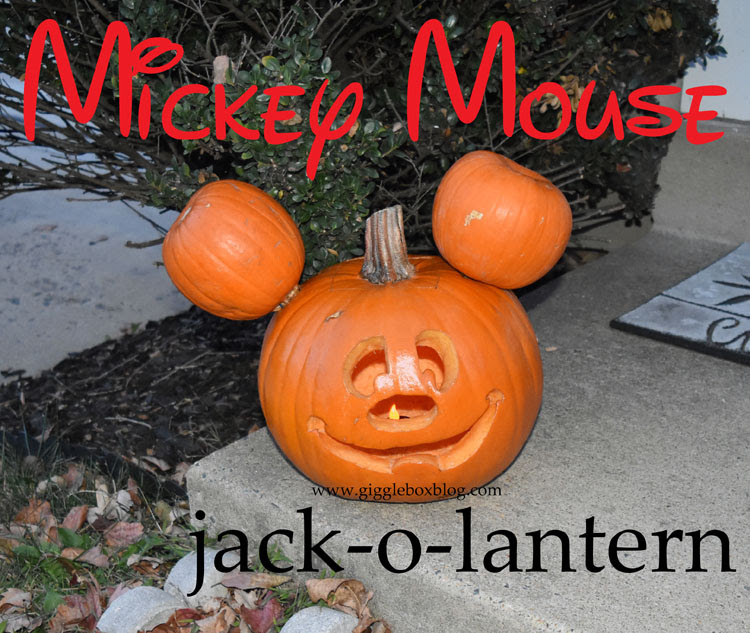 Are you thinking about making a Mickey jack-o-lantern for Halloween? If so, I would love to see them. Tag me in your pictures on Facebook at Gigglebox Tells it Like it is, Instagram @wvugigglebox, and Twitter @WVUGigglebox.